To quote a song from Pisces, Aquarius, Capricorn and Jones Ltd, it’s Hard to Believe. 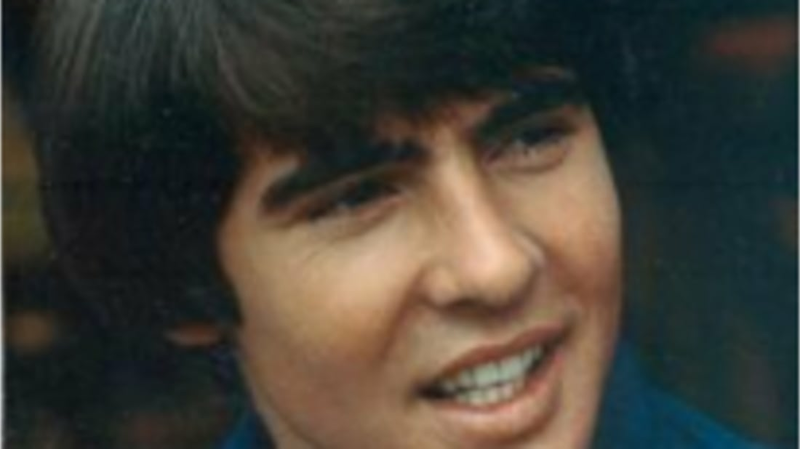 Davy Jones, the cuddly member of the Monkees, the master of the maracas, and the guy with the fanciest footwork, has left us at the age of 66. Here's Jones showing off his British music hall roots in this clip from the movie Head, plus some memories of the Monkees we originally published in 2008. Bob Rafelson and Bert Schneider were aspiring filmmakers who believed that Beatlemania could be somehow translated into a US phenomenon. Their ultimate inspiration came from the “Can’t Buy Me Love” sequence in the 1964 Beatles film A Hard Day’s Night. They came up with the concept of a sitcom about a pop band in which each episode would include an original song and a fun film “romp,” similar to the one featured in the Beatles’ film. David Jones was born in Manchester, England, and (thanks to his diminutive stature) his father hoped he'd become a jockey. However, a talent scout happened by his school, liked Jones' looks, and asked if he could sing. David was recruited to play the Artful Dodger in a West End production of Oliver! He ended up moving to New York to perform with the Broadway cast of the show, which is how he happened to appear on the Ed Sullivan Show the same night the Beatles made their U.S. television debut. Jones later said, "I saw the girls in the audience going crazy and decided that I wanted a piece of that." Michael was four years old when his parents divorced. His mom took a secretarial job at a bank to help make ends meet. She was also something of an artist, and painted the bank windows for various holidays in order to earn extra money. It occurred to her one day while typing and trying to erase an error that a painter simply paints over any mistakes. She started experimenting with white tempera paint to cover up typos and eventually marketed her invention under the name "Liquid Paper." When she passed away in 1980 Michael inherited some $50 million of her white-out fortune. In the meantime, though, young Michael yearned to be a musician and formed a folk band. He was also a burgeoning songwriter, and by the time he was hired as a Monkee, Linda Ronstadt had already recorded a song of his called "Different Drum." George Michael Dolenz grew up in a show business family. His father had starred in the TV series The Count of Monte Cristo, and his mother worked as an agent. When Micky was 11 years old, he landed the lead in a television series called Circus Boy. As a teen he sang, played guitar and occasionally drummed in various garage bands. But it was actually his knack for impersonations and improv as well as his comedic sense of timing that landed him a role as a Monkee. Peter Tork: Suggested to the group by Stephen Stills! After Peter Thorkelson graduated from college in Connecticut, he spent much of his time playing folk music in various clubs in New York's Greenwich Village. He eventually moved to the West Coast and got gigs on the L.A. folk circuit. Stephen Stills (later of Buffalo Springfield and Crosby, Stills, and Nash fame) auditioned for The Monkees and was told that he'd be perfect for the show if only his hairline wasn't already receding and his teeth were in better shape. Rather than being bitter at the rejection, he recommended his good friend and look-alike Peter Tork. Peter had the appropriate "look" and could also play guitar, bass and banjo, so the group was now complete. The show was an immediate hit and won an Emmy Award for Outstanding Comedy Series after its first season. Their success was something of a double-edged sword, however, because the group felt compelled to go out on tour to prove themselves to those critics who claimed the Monkees weren't musicians. But in the record business, it's always a matter of striking while the iron is hot, so the band had to write and record songs in between gigs. And then there was the matter of filming the next season of the series. As John Lennon later said when asked his opinion of The Monkees: "They've got their own scene, and I won't send them down for it. You try a weekly television show and see if you can manage one half as good!" If nothing else, the Monkees gave some fledgling songwriters their first national exposure. "I'm a Believer" gave Neil Diamond his first number one hit as a songwriter. They also gave Harry Nilsson (who would later go on to have hits on his own with "Without You" and "Everybody's Talkin'," to name a few) his chart success when they recorded his tune "Cuddly Toy." One of the Monkees' number one hits was "Daydream Believer," a song Davy Jones hated at first. He felt that it wasn't in his key, and he didn't understand the lyrics. (He was from England and didn't know what a "homecoming queen" was.) It wasn't until after the tune topped the charts that he grudgingly admitted, "Maybe it's not that bad of a song after all." The Alternate Title of "Alternate Title"
Micky Dolenz composed a tune that he named after a phrase he'd heard on a British TV series called Till Death Us Do Part. When the song was released, however, BBC censors insisted that its name — “Randy Scouse Git” — be replaced with an alternate title, since it was some sort of obscenity in British slang. Dolenz complied by re-naming his song "Alternate Title," and it went all the way to #2 on the British pop charts in 1967. Please feel free to share your Davy love and favorite Monkees TV moments/songs/whatever at this sad time. It will hopefully make us all feel just a little bit better.